For the many out there possessing a sweet tooth, you surely know how expensive it can be to support those cravings, even those done in moderation. Sweets like pastries or candy can seriously lighten your wallet if you buy them at your local grocery store, but there are other ways of enjoying these sweets without overdoing it or spending too much. Specifically, with candy, you can try making your own using this recipe for Manuka honey sesame seed candy. These candies are both easy to make and flavorful to the point that you won’t believe they ever weren’t a part of your life. 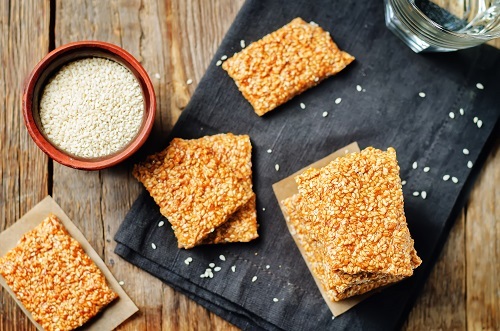 While commonly seen as sesame bricks in Middle Eastern restaurants and shops, this recipe does contain the unusual addition of tahini, but, fortunately, this addition reinforces the candies’ sesame flavor while helping to keep them tender as they harden. To begin, lightly coat one square, eight by eight-inch baking pan or dish with canola oil. Then, combine your untoasted sesame seeds, the Manuka honey, the sugar, and the kosher salt in a deep but small saucepan. Bring everything to boil on medium to high heat, cooking for about two minutes and stirring vigorously. Now, stir the tahini in, and, once your mixture has begun boiling again, cook it between one and a half and two minutes or when the mixture has thickened. Stir the mixture briskly and, working fast, scrape your mixture into your prepared dish, using the backside of a spoon in order to spread everything evenly. Let the mixture cool slightly, then use a table knife with a rounded edge or a thin spatula for loosening the candy slab around its edges. Place the slab on a cutting board before cutting it into one-inch pieces. You can serve the candies immediately—though they’ll be slightly chewy—or they can sit for about an hour until they harden. Note: You should have about 64 servings for this recipe, and you can store them in an airtight container for about two weeks when stored at room temperature. Need to order some Manuka honey so you can make this delicious recipe? To get your order started, click here. And, remember, we offer FREE shipping on all orders of $150 or more.